What I like to wear most often. 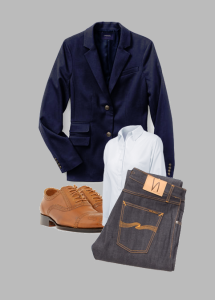 In the fall and winter, I most often wear a crisp shirt, a blazer, dark jeans and nice shoes or boots. (In the summer I’m just miserable and wear mostly chinos and polo shirts while I complain that I am too hot). I do need some suits — both summer and winter — and I have those, but they truly are 20 per cent items. So why don’t I just buy really nice shirts, quality blazers, my favourite brand of jeans and footwear that I love? Because I’m often swayed by sales, bright colours, vivid patterns or interesting stitching. I (almost) never wear those clothes. Quality blazers — none of the pilling junk I got at the Gap last year. Solid or striped shirts in colours I will actually wear — no bright purple. I am not going to limit myself in the footwear department — I do wear all the shoes I own and I need an outlet for my love of the (slightly) garish. Update — Bullets are fixed! And not due to any css on my part since that would be a silly waste of three days. I fully support this plan!